Recycle Group is a duo made up of Andrey Blokhin (1987, Krasnodar, Russia) and Georgy Kuznetsov (1985, Stavropol, Russia). They both studied at the Art Academy in Krasnodar and, before that, Georgy studied in Stavropol, also in Southern Russia. Blokhin and Kuznetsov belong to the latest generation of Russian artists, whose experiences and visions are aimed at the global scene. Their research is full of Eastern and Western suggestions conveyed in a series of experiments that address a variety of issues and employ a wide range of different materials. Blokhin and Kuznetsov have always worked together, linked by friendship and an artistic understanding since their childhood, although they have only been working under the title «Recycle Group» for seven years. Recycle Group, as its name implies, uses mostly recycled materials. In addition to this, their research and interests drive these two artists to focus through their work on issues relating to technology and the impact on society of progress in communications, such as social networks, with a special focus on Facebook. 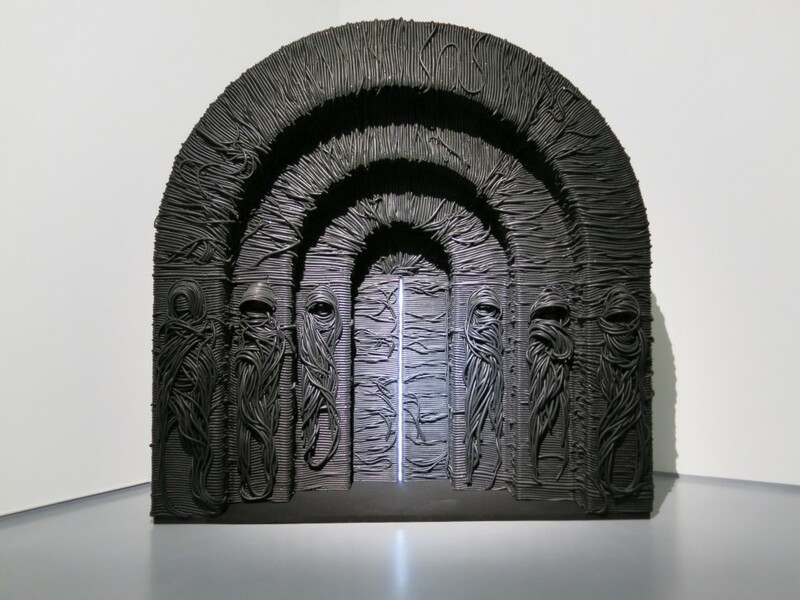 In general, their sculptures and installations appear to us as an «archeology of the future» in which distinctive antithetical elements, such as ancient and modern, sacred and profane, east and west, merge into one to provide us with a new and unexpected perspective on contemporary life. Blokhin and Kuznetsov, as Recycle Group, have held exhibitions in Russia, the United States, Brazil, France, the United Kingdom, the Netherlands and Hong Kong. They also participated in the Venice Biennale in 2011 and 2013. Among their awards, they have received the Kandinsky Prize for the Best Young Artist Project of the Year, aimed at promoting young contemporary Russian art, and the Terna Prize in 2012. In 2013, their projects were featured in a solo exhibition at the Multimedia Art Museum and the Triumph Gallery in Moscow, and as part of the «Glasstress Project» at the Venice Biennale, in which they had also participated in 2011. Also in 2013, their work was presented at the Gazelli Art House in London and at the Art Paris Art Fair, which involved representatives from Suzanne Tarasiève Gallery. On that occasion, they placed a monumental installation on the facade of the Grand Palais. Many of their previously exhibited works appeared at the ART14 fair in London. Breath. Part 1, the work that was entered in the Terna Prize 04 in the «Connectivity» category is an installation that looks like «a piece of land that breathes» (from the exhibition catalogue). The interview took place via e-mail during May 2014. Arshake: What is the role of the artist in the current system of art and society? Andrey Blokhin (Recycle Group): The role of the artist in society’s system is like that of a sensor which detects the subtle frequencies of change in the world. In the art world, however, the artist is an inalienable element. The Terna Prize, in one of its early editions, published a forecast of the state of the art world from 2010 to 2015. The results showed what is now the current scenario. Among these, there was also the fact that the crisis would have caused the dominating rules to be subverted, as well as more social involvement in art. Is this really what is happening? I think that the social role of art is always the same. Rather, the point is that, nowadays, only the subjects change, as usual, but the role itself remains the same. What did your participation in the Terna Prize mean for your experience and research? What real opportunities has it generated, including in the marketplace? I can’t really say whether the Terna Prize has actually created new opportunities. We have been involved in many events (exhibitions, conferences, etc.) and the result comes from all these things as a whole. What should Italy have (that it does not already have) to encourage creativity and make our country even more competitive at international level? And which country do you believe to be the best from this point of view? Art and creativity in Italy have always been a pretty high level. Probably, participating in a large number of international projects and establishing important partnerships with other countries could be a positive ingredient [to support creativity]. In what direction has your most recent research evolved? Can you tell us about any future projects and plans? In fact, I’ve been working on various new projects this year, but they’re for a show in New York. Terna is a company that deals with providing energy to the country. Its commitment to the Terna Prize focuses on transmitting energy to art and culture and creating a network for supporting and developing talent. Do you think that the Terna Prize formula is still relevant for the promotion of art? Do you have any suggestions for the next edition? Undoubtedly it is a good thing that this award exists. Awards are always a source of new opportunities for artists. It would be important for the winning artist not to be forced to hand over his/her work. In fact, some works that have been submitted for the award are significant for the artist, who is not always ready to be separated from his/her creations.